We have a spoiler for the April 2019 California Found box! About Herkimer Diamond: A stone of attunement, Herkimer Diamond energizes, enlivens and promotes creativity. It stimulates psychic abilities, spiritual vision and guidance from higher dimensions. Herkimer Diamond clears all chakras (energy centers in the body), allowing the body to be an open channel for spiritual energy to flow. This stone is said to be good for detoxifying. California Found is a monthly subscription box which features products from California makers that can typically only be found in California! Subscribers receive several items per month that could be beauty, gourmet, style, or home goods. If you subscribe on or before the 30th of the month, you will receive that month’s box. If you subscribe after the 30th, your subscription will begin with the next month’s shipment. If we are sold out of boxes the month you subscribe, you will be notified and your subscription will begin the following month. 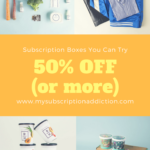 COUPON: Use code MSAGET20 to save 20% off your first box! Check out our California Found reviews to see what’s been in past boxes! So happy I subscribed yesterday-can’t wait for this box! What is the chain made from? I couldn’t find out on their website…? I wonder about the length of the chain. The website says it can be 16″, 18″ or 22″. I hope it is a longer length (20 inches would be awesome). 16 inch necklaces don’t fit me well…i think 18-20 is the most versatile length. The chain is silver-plated brass. I’d love to snag it and a box, but I have sensitive skin when it comes to things like jewelry. If it were more hypoallergenic (like sterling silver or 24k gold) I’d snap it RIGHT up. "Do you mean how you have to scan the coupon into your phone now? If so, you can still use that in store. :)"